A while ago, I discovered a wonderful book called Pagan Prayer Beads by John Michael Greer and Clare Vaughn, which explains how to make your own prayer beads, as well as giving lots of ideas about how to use them. Basically, they're a meditation/visualisation/spell aid, which you use to help you focus. You have a mantra or chant to say with each bead, and you just follow the chain around. You can have your beads in blocked sets - for example, I have a lovely druidic set that I bought at an event, which has nine beads each in green, yellow and blue for the land, sky and sea - or you can use a repeating pattern. This prayer bead bracelet that I made has beads for the elements: tiger's eye chips for the earth, citrine for the air, polished red wood for fire and lapis lazuli for water. I have used the one I made with various different sets of words, and sometimes when I'm preparing a spell or ritual, I'll use it to help me focus on how to work with each element. 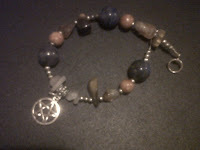 I also love that it's a bracelet, so I can wear it and remind myself of the blessings of each element discreetly. They are very pretty and I could probably make these too. I just wish I had the discipline to use them myself, but I'm not a ritualistic person. I use my prayer beads every night... it really does put me to sleep.